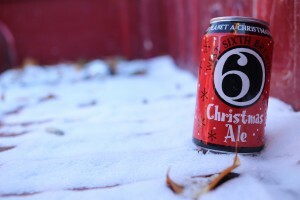 West Sixth Brewing Company will release its West Sixth Christmas Ale on Dec. 2, and the canning begins tomorrow. Yep, Christmas Ale in cans. I do love West Sixth. We’ve got some exciting news today, and we wanted you to be the first to know: We’re releasing our first ever seasonal beer in a can – the West Sixth Christmas Ale! This beer is a dark spiced ale with the aroma of cinnamon and nutmeg. Weighing it a 9% ABV, it has a nice backbone that will hold up to the chilliest of nights. This is our slightly darker taste on a holiday beer, and will be perfect for evenings by the fire! We’re canning the beer tomorrow, and will be releasing the beer at 3pm on December 2nd at the taproom (the Monday after Thanksgiving). It will also be available in limited quantities at retailers throughout Kentucky. We’re only going to make 500-600 total cases of this beer, so we expect it to sell out quickly! It will also be available on draft in the taproom starting that day. This is our first time ever doing a seasonal in cans — it’s also the first Christmas Ale canned and distributed in Kentucky. Because of the challenges with doing small runs of cans, we’ve had to figure out a different sort of process to label the cans and can the beer. It’s been a fun adventure and we can’t wait to share the results with you. Keep an eye on our Facebook page and website for more details. Yeah, this is a beer blog, but if you live in Kentucky and you like cocktails, there’s a fair chance you also like bourbon. This is the cover story I wrote for this week’s edition of LEO Weekly about local bourbon writer and Wall Street Journal best-seller Fred Minnick and his new book, “Whiskey Women: The Untold Story of How Women Saved Bourbon, Scotch and Irish Whiskey.” Enjoy. Fred Minnick, clad in a blazer and signature ascot, holds up the glass of bourbon and peers through it. He trails off for a moment, gathers his thoughts and continues, bringing the glass of caramel-brown bourbon back down to eye level. He sniffs the bourbon deeply, and then takes a small sip. I remember hearing in passing sometime ago that the Wiedemann brand had been bought and that a new version of Wiedemann Special Lager was being brewed and distributed, but that information fell out of my mind. Until recently. Geo. Wiedemann Brewing Co. now has placed its lager in more than 300 locations around Kentucky (though none in Louisville, if the company’s locator is accurate), and three additional beer styles are in the hopper: a bock, an amber lager and a Bavarian-style marzen. This recent story even reports that owners Betsy and Jon Newberry plan to open a brewery and taproom in Newport, the city where the original Wiedemann originated, sometime in 2014. The Newberrys have been in business for over a year now, and they say there is even plans for a bottling plant. I have to admit that since Falls City started cranking out beers again, I’m intrigued by the new old brands that have been popping up, such as Sterling and Hudepohl. I like the nostalgia, obviously, but I also have mostly liked the products. I haven’t tried the new Wiedemann yet, but it looks like as good a reason as any to take a drive northeast soon. Anyone else out there tried it? 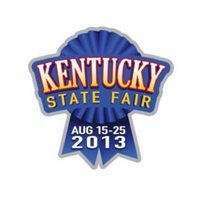 The Kentucky State Fair is about a lot more than livestock, deep fried candy and that creepy Farm Bureau giant – there’s also the annual homebrew competition, and this year there are 529 entries. Yeah, that’s a lot of entries. Leah Dienes of Apocalypse Brew Works is the person charged with making the judging happen. I chatted with Dienes, and she told me she has 48 judges from Kentucky, Indiana and Ohio on board, and nearly half are Beer Judge Certification Program (BJCP) certified; this number includes two national judges and a master judge. “BJCP judges are dedicated folks who travel to judge competitions with no compensation and have had to take exams to get into the program and judge competitions to stay active and to move up the ranks,” Dienes said. Here’s how the judging works: Each beer receives a written sheet describing its aroma, appearance, flavor, mouthfeel and overall impression, and two judges will score each beer based on these categories. They are separated into the 28 BJCP styles, and those are also separated into the 80 substyles. Dienes said that between the two scores, with an allowable margin of 7 points between them, the final score is determined within a scoring range of 0-50. Creepy. As. Hell. Luckily, he’s not part of the homebrew competition. I asked about palate fatigue since, well, that’s a lot of freaking beers. She said while it can be a problem, the way it is dealt with is to keep flights somewhere between 8 and 12 beers. The most competitive category? The American Ale category, which includes APA, American Amber Ale and American Brown Ale. Judging takes place tonight starting at 7 p.m. and tomorrow morning and afternoon (9:30 a.m. and 12:30 p.m.) with multiple flights each night. If you’re at the fair, be sure to stop by and check it out. And if it sounds like fun, well, Dienes said it absolutely is. 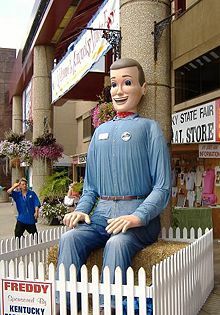 Dienes, of course, has been a participant – and usually a big winner – in the state fair contests before. Her advice to would-be brewers is of the common-sense variety. Salsarita’s in Middletown will play host to Stampede Sunday and Happy Hour this Sunday, Aug. 4, from 2-5 p.m.; basically, it’s a pre-event signup party for the Urban Stampede on Aug. 24. Why is this being posted on a beer blog? Because Kentucky Ale is one of the sponsors, which makes it a good excuse to drink some local beer. You can getcha some if you show up to sign up. You can also get happy hour prices, enter to win random prizes and also get $60 of the $140 entry fee. The whole deal benefits Dare to Care Food Bank.